A view of Southwell from the south, c.1905. Southwell is a small town situated north east of Nottingham on the A612. It is dominated by the Minster which towers above the town and is the focal point. Not only are the buildings very impressive but the status they give to the town is quite beyond its size. The town is not situated on any major road junctions, although it is reasonably close to both the A614 Doncaster Road and A46 Newark Road. A branch of the L.M.S Railway’s Newark to Nottingham line was extended to Southwell in 1847 and later continued to Mansfield. The line was closed in 1964 and part of the route is now used as a public footpath and bridleway, known as the “Southwell Trail”. The parish of Southwell covers 5,000 acres of land and includes the hamlets of Normanton, Easthorpe and Westhorpe. Historically, Southwell itself was divided into The Burgage (a separate manor within the parish) to the north-east of the Minster and the Prebendage which was based around the collegiate church and its associated properties and developed into the town core. The population of Southwell remained fairly static during the 19th century, around 3,000. Today it is has doubled to about 6,000. Most people work outside of Southwell and it has become a dormitory town. However, it has been claimed that Southwell has more millionaires among its residents than anywhere in the county! Although there is some evidence of Neolithic people in the area the first significant development in the town was the building of a large Roman courtyard villa in about 400 A.D. It was one of the largest villas in the Midlands, extending over an area 80 yards by 100 yards and including at least four mosaic pavements and a piscine or cold bath measuring 24 by 15.5 feet. The next important event of which we have evidence was the gift by King Edwy in 956 to Oskytel, Archbishop of York, of the area known as Southwell and a number of other parishes. It is believed that this was done as a form of bribery to keep the Archbishop on the side of the King, as nearby Scrooby was later given to Oskytel’s brother. It established a link with the See of York which has endured for over a thousand years. 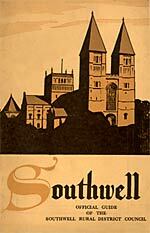 The importance of Southwell becomes clear with a detailed description in the Domesday Book. The valuation of the Manor of Southwell was the highest in the County. The Archbishop of York at that time was Thomas of Bayeaux, a close friend of King William’s brother and he chose Southwell in which to start the building of a church in 1108. According to Nikolaus Pevsner, author of ‘The buildings of England’, by the 12th century Southwell Minster had become one of the major churches in the province of York. Building was carried out for the next two centuries in the early English and Perpendicular styles, during which a large window was inserted in the western front, the eastern end rebuilt and the highly ornate Chapter House added to the northern side. The site had been in use from much earlier times and a tessellated pavement dating from the second century exists under the west side of the south transept. It has been thought that even before the building of the Minster the existing church had a school for the instruction of church official’s children. The first written evidence for a school dates from 1238. The town has always been noted for the excellence of the education it provides and this reputation has been enhanced by the present Lowes Wong Junior School and the Minster School, the latter is particularly noted for the musical education it provides. The Minster became one of the major churches in the province of York. The provision of accommodation for the Archbishop was begun in 1360 with the construction of a large ornamental palace on one and half acres on the south side of the Minster. Several Archbishops who stayed there on various occasions en route from York or Ripon to London are buried in the churchyard. Cardinal Wolsey stayed there in 1530. The palace was used by the Scottish Commissioners during the English Civil War and became a ruin afterwards. The only part of the old building still in use is the Great Hall, restored in the 1880s. Southwell became a cathedral town when in 1884 the Minster was consecrated as a cathedral and with the appointment of a bishop for the new diocese. Originally it comprised almost all the counties of Derbyshire and Nottinghamshire. It was later reduced to just Nottinghamshire in 1927. One hundred years later in 1984 the Queen distributed Maundy Money at the Minster. 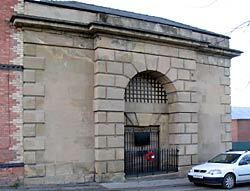 Gateway to the House of Correction. In 1611 a prison, ‘The House of Correction’, serving the County of Nottinghamshire was built at Southwell which was later enlarged in 1806 to house 150 prisoners. The designer was the Reverend J T Becher. It was closed in 1880 and was later turned into a lace factory which employed 230 people until its eventual closure in 1956. The site was later developed by a local family, Rainbows, as a base for their delivery firm which now employs 140 lorries serving a radius of 50 miles around Southwell. Other short term industries which thrived in Southwell for short periods were malting, basket making and a cheese factory. From the late 17th century Southwell supported a substantial number of framework knitters, which lasted until the general decline in the19th century, due to the unprofitability of the village industry consequent on the concentration of production in larger factories in places like Nottingham. In 1785 a cotton mill was built at Maythorne which later became a silk mill and operated until the middle of the 20th century. There remains today the old flour mill, known as Caudwell’s mill, on the road out towards Hockerton. The mill used the power of the river Greet, which runs nearby, to grind corn for Southwell and Normanton. In 1851 Charles Caudwell bought the mill and increased its capacity. Local grain was brought to a wharf at Fiskerton and later foreign imports from Australia and Canada were brought in on the L.M.S railway line. 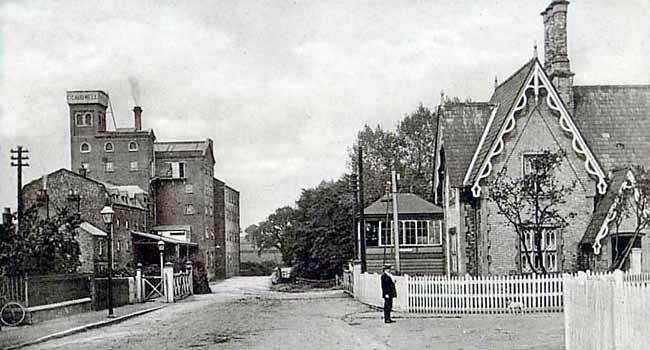 Caudwell's Mill and Southwell railway station, c.1905. Agriculture was once the dominant employer of labour but the number of workers employed in 1900 was 60% of the number employed earlier in the century. A further fall during the next century reduced the numbers to less than a tenth of the 1900 figure. This reduction was first caused by the depression in agriculture and the provision of better paid jobs in the towns and the mines and later of course by the growth of mechanisation. Today most farms employ very few workers to farm the land. It is perhaps with the agricultural connection that Brackenhurst College (now part of Nottingham Trent University), which is a short ride out of the town, has become a renowned college teaching agriculture, horticulture and other related topics. Another landmark just outside of the town is the Southwell Workhouse. The building has been brought back to life by the National Trust after years of neglect and decay. It was originally earmarked for residential housing but as it was the last of these type of workhouses and was in a state capable of being renovated it was acquired by the NT. It was built in 1824 to house the poor of 60 parishes known as the Southwell Union. It was designed and created by the Reverend J T Becher, a local magistrate and poor law reformer and Vicar-General of the Minster. It was to be the blueprint for many such later workhouses throughout the country. As well as the house becoming a working museum the gardens have been brought back to life and now produce vegetables and fruit which is sold on the premises. Another notable name connected with Southwell was Lord Byron. 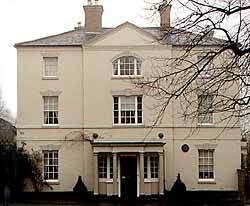 Byron’s mother rented the Burgage Manor between 1803 and 1808 and Byron spent his holidays from Harrow School with her. His time here was extended when as a 15 year old he fell in love with his older cousin at Chaworth and he could not return to Harrow! The Eliza of his early poems lived in the Burgage opposite. His signature is preserved on the wall. The oldest Inn in the town is the Saracen’s Head where King Charles I stayed prior to surrendering to Cromwell’s men in 1646. The earliest surviving parts of the building date from the fifteenth century. Another pub takes its name from the famed Bramley apple which was produced in the town in 1856. It was the result of a pip planted by a local lady and its qualities were recognised by Merryweather, the nurseryman, who propagated it on a commercial scale and it retains its place as the premier cooking apple a century and half later! Map of Southwell, c.1920 (click on the image to view a larger version of the map). There has been a cricket club in the town for over two hundred years; the first recorded match was in 1787. The Top Ground at Brackenhurst was at that time the major venue for cricket after Trent Bridge in Nottingham. In 1846 an England-11 played a benefit match at Brackenhurst for William Clarke, the Nottinghamshire and England captain. One Southwell cricketer toured Australia and New Zealand with George Parr’s undefeated team.